There are many people who just hate fedora because its default behavior related to Nautilus file manager. In Fedora, Nautilus launches a new window for each link/directory you open through it. This can be seriously irritating for many people, as you will be left with bunch of windows to close even after a small file system browse. Hence many people try to avoid Fedora even though its a rock solid Linux distribution. Well, many people out there don't know that the fix this default behavior is quite simple. Just follow the following steps to fix this default behavior. Open Nautilus. This should simple to do. Just double click on Computer icon shown on your desktop. 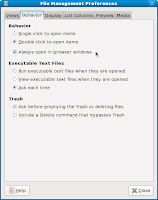 In Nautilus preferences go-to the second tab named “Behavior”. You will see a check-box named “Always open in browser windows”. Select this check-box to avoid opening a new window for each browse. If you want the default Fedora behavior keep this check-box unchecked. Technorati tags: OpenGuru, Fedora, Fix Fedora's default open behavior with Nautilus.